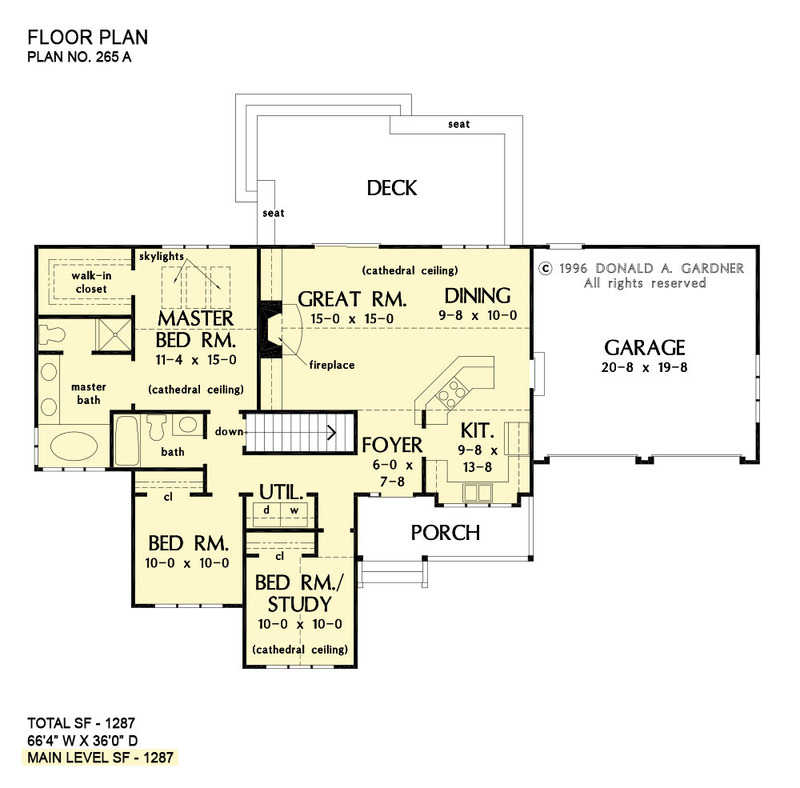 Economical means exciting in this well-proportioned three-bedroom country home plan with fun exterior detailing. The heart of this home is the common great room, kitchen, and dining area, which provides exceptional openness for visual interaction. Cathedral ceilings and built-in shelves and cabinets on either side of the fireplace add to the excitement. The spacious kitchen features an angled cooktop island with breakfast bar. A cathedral ceiling expands the master suite with its walk-in closet. A whirlpool tub, separate shower, and dual vanities highlight the master bath in this exciting floor plan. 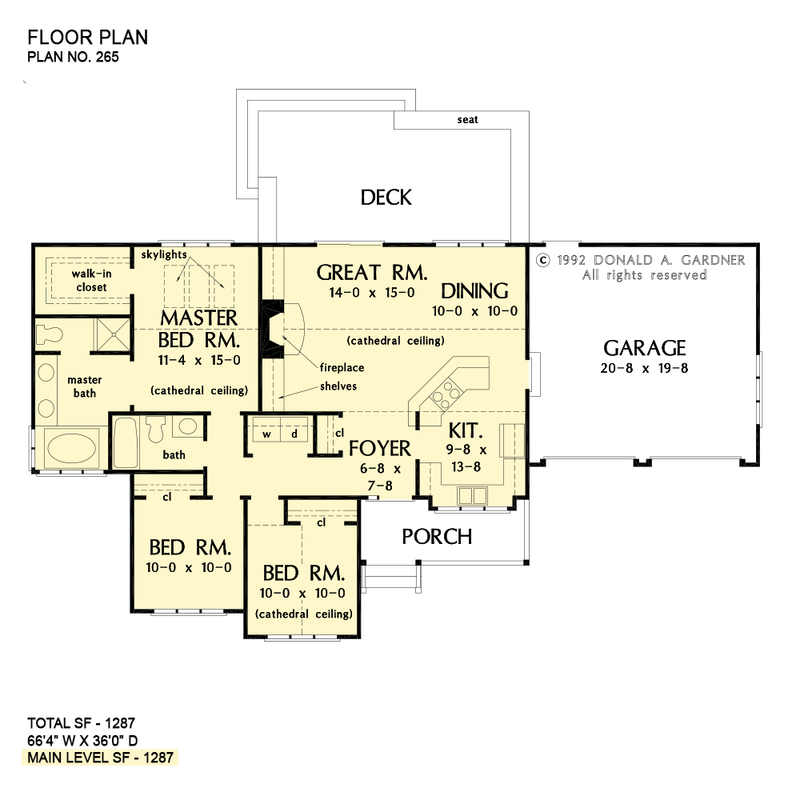 1st Floor: 1287 Sq. Ft.
House Dimensions: 66' 4" x 36' 0"
Great Room: 14' 0" x 15' 0"
Master Bedroom: 11' 4" x 15' 0"
Foyer : 6' 8" x 7' 8" x 8' 0"
Dining Room (Cathedral): 10' 0" x 10' 0" x 12' 0"
Great Room (Cathedral): 14' 0" x 15' 0" x 12' 0"
Kitchen : 9' 8" x 13' 8" x 8' 0"
Garage : 20' 8" x 19' 8" x 0' 0"
Master Bedroom (Cathedral): 11' 4" x 15' 0" x 12' 0"
Bedroom #2 (Cathedral): 10' 0" x 10' 0" x 12' 0"
Bedroom #3 : 10' 0" x 10' 0" x 8' 0"
Porch - Front : 15' 4" x 6' 0" x 0' 0"
Deck / Patio : 24' 8" x 12' 0" x 0' 0"